Wiping up the counter after doing the dishes yesterday morning, one could almost hear the cartoonish tire-screeching sound as I stopped the paper towel literal millimeters from this leggy leeeetle fella I saw parked there. In a world full of people who have 1,276 more important things to do than waste time over trespassing insects, I’m that guy: the one who goes to silly lengths to follow my motto of “if you’re not bothering me than I’m not bothering you,” and return such living things to the great outdoors. Don’t tell anyone, but I’m even known around these here parts to unlatch window screens and give freedom back to flies. So. Using a drinking glass and my coaxing skills I got this bug safely outside and installed on the jasmine vine near the backdoor before managing the above nice macro shot (click for the bigger picture). 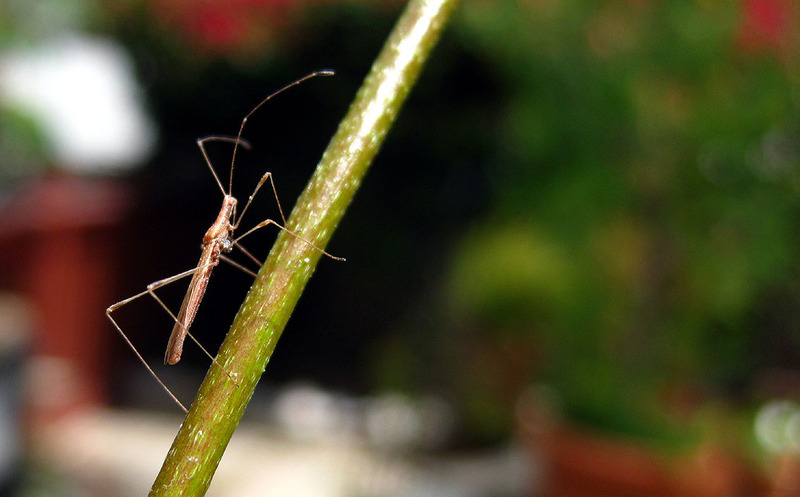 UPDATE (10:15 a.m.): The ever-reliable bugguide.net informs me it’s a stilt bug. This entry was posted on Monday, August 2nd, 2010 at 7:12 am and is filed under animals, backyarchaeology, nature, outdoors, updated. You can follow any responses to this entry through the RSS 2.0 feed. Both comments and pings are currently closed.